It’s not the classiest place for a meal, but who hasn’t taken advantage of the convenience of in-car dining? Celebrate the establishments who allow you to take multitasking to a new level on July 24, National Drive-Thru Day. In 1947, the first drive-thru restaurant is reported to have opened. Called Red’s Giant Hamburger, it was located on Route 66 in Springfield, Missouri. Be it a double espresso and chocolate muffin on the way to work; a burger break between meetings or even a pizza to take home to the family, drive-thrus allows us to go from one place to another, getting things done without that pesky parking problem. A little late to the game, the first McDonald’s drive-thru was in Sierra Vista, Arizona. The original restaurant, in San Diego, was drive-thru only. Jack-in-the Box is also credited with creating National Drive-Thru Day. Yeah! All you need to know is in the name: In and Out! 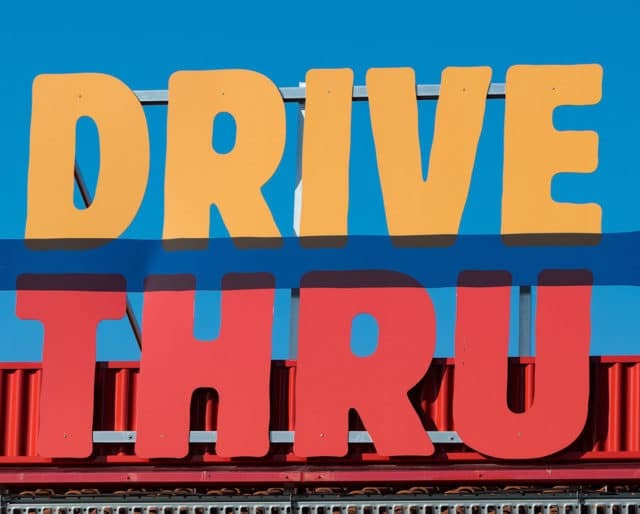 The chain is the longest running drive-thru restaurant in the US. Use this special day to get out of your drive-thru comfort zone and experience someplace different! If you're normally a McDonald's visitor, try a Burger King, or branch out even further and visit a Taco Bell, a Jack In the Box, or another new-to-you restaurant. Many fast food restaurants love National Drive-Thru Day as much as we do and will be offering fun specials to celebrate. Follow your favorites on social media or check their websites to find out about deals near you. Go all-out and grab a group of friends to celebrate together. Pile into a mini-van, turn up the radio, and hit your favorite drive-thrus — hamburgers at this one, milkshakes at the next, french fries at the next. Drive-thrus are meant to be used. Why go to the trouble of finding a parking spot, walking to the restaurant, standing in line, waiting for your order, and having to remember where you parked your car when the restaurant has kindly given you a way to skip all those steps? An unfortunate side effect of in-car dining is some messiness can occur: dropped french fries, mislaid ketchup packets, muffin crumbs, and tortilla chips. But a clean car is a happy car (and a happy car owner), so drive-thrus can be a great motivator for a car wash.
It’s not only food that gets passed from one open window to another these days: businesses from banks to pharmacies have also embraced the drive-thru, ensuring we never have to get out of our cars unless we want to (or miss the end of a favorite song or podcast).